Most (virtually all) episodes of heart attacks (myocardial infarction, MI) and deaths from coronary heart disease (CHD) occur in people above the age of 70 years. This group is generally regarded as "elderly". Conventional wisdom is that CHD and its most serious manifestation of MI, is "due to cholesterol". However previous Posts have shown the absurdity of this. The Framingham study from the USA was a 30 year follow-up of the population of this town in Masachussets. The objective was to investigate the factors that would be associated with early death, specifically death from CHD. The expectation was that the cholesterol level of the blood would be the major factor, but it was not to be. 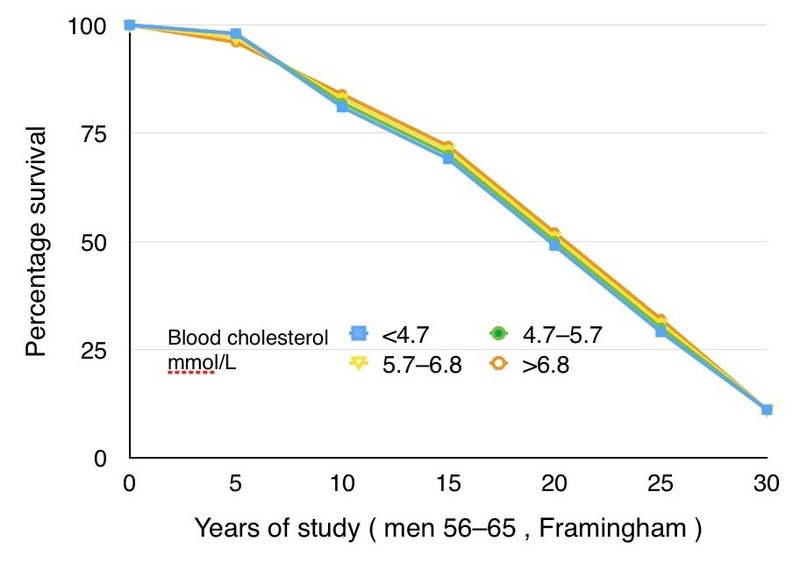 In young men a high blood level of cholesterol predicted a higher death rate, but this was only minimal in young women. 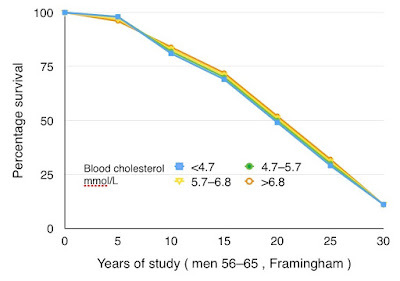 In men and women above the age of 50 years, blood level of cholesterol did not predict death from CHD or from "all causes". Survival of men in Framingham. Note the survival is identical in all cholesterol groups: blood cholesterol did NOT predict survival. How remarkable that this conclusion did not penetrate medical consciousness. Despite the fact the great majority of deaths from CHD have been in people above the age of 50 years, reducing blood and dietary levels of cholesterol has continued to dominate medical activity. Statin medications to achieve cholesterol-lowering were introduced in the late 1980s and the result of the first clinical trial was published in 1995. 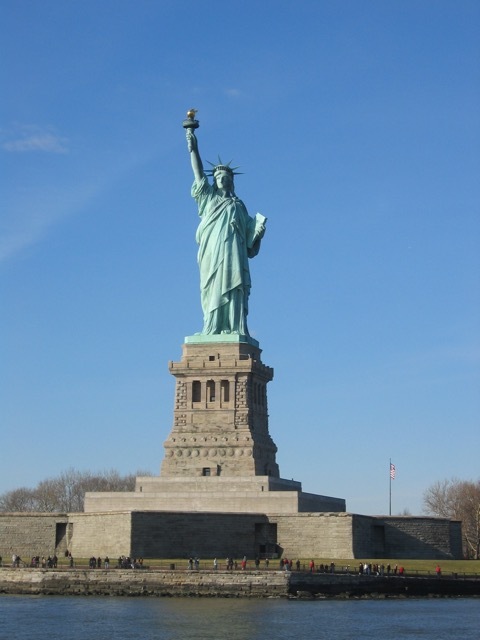 However it was only in the 21st century that statins came into widespread use. The logic was that reducing the cholesterol level of the blood would lead to a reduction of age-adusted deaths from CHD. As things have turned out, the small benefit from statins is not related to cholesterol reduction. Although this is clear from the first published trial, such data has been withheld from the publications of subsequent statin trials, and the published conclusion is denied. The 20th century epidemic of CHD was coming to an end at the close of the 20th century and so there could only be a low expectation of statin being of any benefit, irrespective of cholesterol. And this has been shown to be the case. A study from the New York University School of Medicine, published this year, concerned the effect of pravastatin given to 1467 participants over the age of 75 years compared to 1400 controls of the same age. The study concluded that pravastatin gave no advantage. There was no reduction of either deaths or coroanry events in those receiving pravastatin. 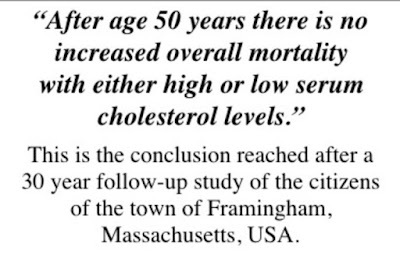 We have seen in a previous Post that a high level of cholesterol appears to give a survival advantage in the elderly, those above the age of 70 years. This is clear from three studies, Honolulu, New Haven (Connecticut USA), and Paris. 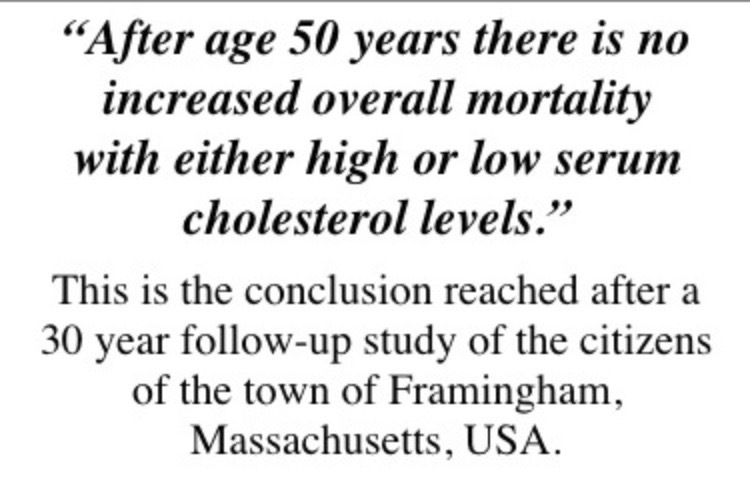 So why are the elderly given interventions designed to reduce cholesterol? There is no reason for well people over the age of 70 years (or indeed of any age) to take statins. If such a person has experienced an MI (heart attack) then there might be a marginal advantage to taking a statin, but in the absence of up-to-date trials the evidence for this is far from strong. Benefit from statins is now less likely than undesirable side-effects. As ever the voice of reason. Can we really believe any health advice in the media or from HMG.? Where one has difficulty steering a course to healthy living is the 'facts' we are presented with about alcohol. Of course drinking too much is a national problem but can I believe how many units I am told I can allow myself? More to follow shortly. Is there any such thing as a healthy diet? This is amazing and surprising at the same time. I go hard on health and fitness and this has really helped me to know the real nature of the situation. Thank you for this please do not storp any time soon.